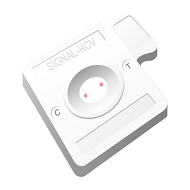 Signal HCV Ver 3.0 | ARKRAY, Inc.
Flow through Immuno-dot Test for Qualitative Detection Of Antibodies to HCV in Serum or Plasma. Rapid visual two dots assay with inbuilt control dot. Tests comprising of mosaic recombinant antigen from the CORE, NS3, NS4 and NS5 genomic regions.